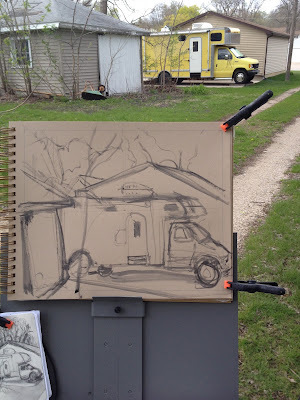 I came upon another camper-of-note*—or as the Brits call it, a caravan--in my back-alley ramblings of my Cedar Falls, Iowa neighborhood. It was a custom job. A Penske rental truck lovingly transformed into a vacation-home-on-wheels by its meticulous and ingenious re-creator. When I first came upon it, it was very early Spring, no color of tree-buds or greening grass had graced the winter-weary drabness. 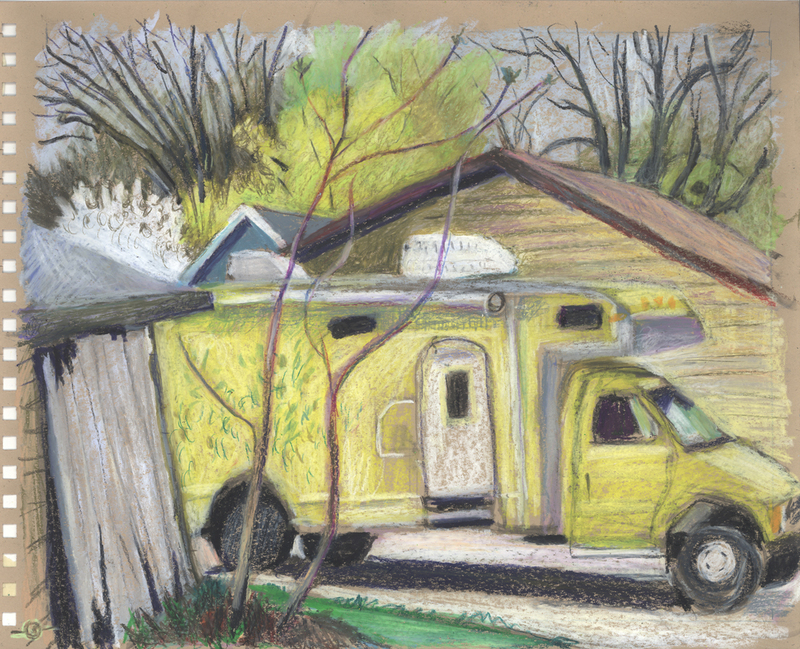 The yellow truck was like a beacon of the still-distant summer. Thus, through the act of sketching the emblematic of where I live, I found myself smack in the middle of the big-issue embroilment which all owner-lived-in-properties are now grappling: the erosion of the quality of our old town neighborhood and the resulting falling property values because more and more houses are being bought by slumlords who do the minimum to care for them. A week later, I returned to do the wax pastel. Grass was greening, buds were showing a halo of new green in the trees above the rooftops. 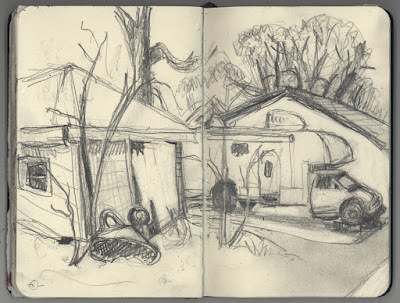 I started with an underdrawing with brush-applied water soluble graphite. “Any room to stand?” He laughed and shook his head. Perhaps, I’d asked an irreverent question. He resumed his polishing. I resumed my drawing. 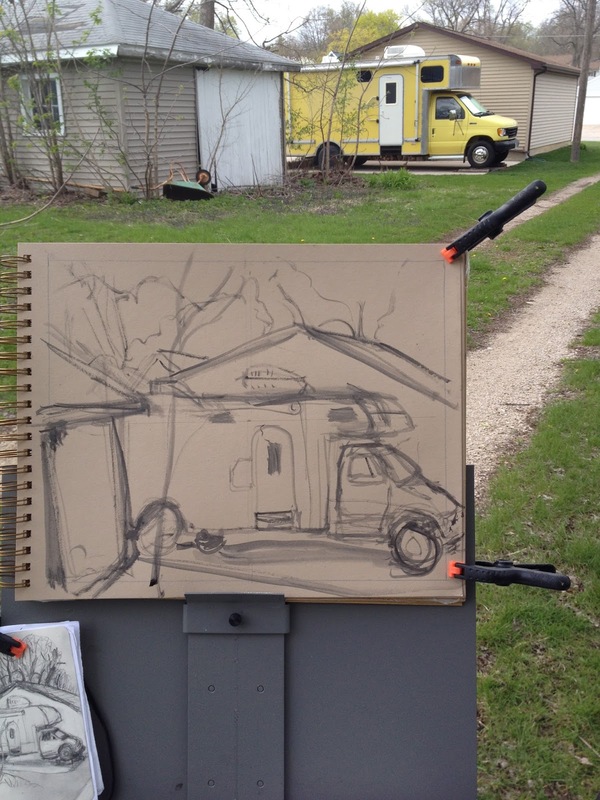 * to see the previous post about another camper-of-note, go HERE.